How will you reflect on the 60th anniversary? What do you hope the legacy will be at this juncture? At every 10-year juncture there is a series of events in Little Rock to commemorate what happened in 1957. The goal has been to celebrate progress and to look at how far we’ve come. My job is to help balance that and to say, "We’re not quite ready for celebration." We’re still working hard on trying to figure out how to get to the point of celebration. What we did in Little Rock was one of several steps forward. It’s about understanding the nature of the journey and the hard work ahead of us and the headwinds of opposition we’re facing. It’s not a journey that’s without obstruction. Why did you volunteer to be one of the students who integrated Little Rock’s Central High School? At age 15 I had already learned enough about what it meant to live under the oppressive conditions of legalized discrimination. I was primed and ready for change. The 1954 Supreme Court decision in Brown v. Board of Education changed the legal landscape 180 degrees. I was aware of this change and thought this was a real opportunity. I knew there would be opposition. But I also knew that I could not in good conscience disobey the laws that schools should be integrated because I had also been taught that we are a law-abiding country. So I joined this group of nine out of a sense of modeling law-abiding behavior. Where do you think we are today 60 years later? How has the US progressed since Little Rock and what do we need to do more of as a nation to address racism, bigotry, and hatred? When people asked me about progress I would always say there has been absolutely none. But my wife would tell me, “You have to acknowledge that some things have shifted.” And begrudgingly I came to accept that. I can live a life now where I am less vulnerable to the forces around me. However, I can’t be used as a barometer and then suggest that progress has been made when I look at the sea of people who are still vulnerable to the forces around them: economically, socially, culturally. We can’t declare as a group that we’ve made progress when not everybody can participate in this so-called progress. What are your biggest concerns about the social and political climate today? What are you most optimistic about? A lot of people are living in abject fear right now simply because they are among the most vulnerable of us—people who fear deportation, people who fear losing their jobs, or medical coverage. The uncertainty is maddening. How are we to extricate ourselves from this? We have to look at the diseased roots of the system. Institutional racism has been around for the past 400 years. If people are unwilling to confront what they see and offer some opposition or resistance then the forces involved in creating this climate are emboldened. But I’m very optimistic because I know there are many people who are hard at work today on changing the way they see themselves and others in this world. We need to encourage that. And this is what Facing History does—it gathers young people together to have them confront their identities and the identities of others so they can learn to live without blinders. Once we begin our own journey we can very consciously confront others—not in ways to put them down or demand that they change—but simply to have them offer explanations for their own choices. What advice do you have for today’s young people who are navigating issues of racism, hatred, and bigotry? They need to know the truth about who we are and they need to understand the historical context. That’s how they can them make more sound decisions. You have to start with that knowledge base. Not even parents can give their kids exactly what they need because kids need to put their thoughts through their own filters. They do it with support from their parents and their friends but basically it’s a personal journey toward understanding and truth. What advice do you have for teachers in the classroom when it comes to addressing these issues? First, they have to understand their main job is not teaching—it’s learning. This means learning about self, about others, and what happens at the intersection between the self and others. So when they’re in the classroom and they’re true learners they have to be aware there is a dynamic between them and each individual student. Second, know that failure is part of the learning process. The whole teaching process breaks down if we’re unable to admit when something doesn’t work. If those two elements can be put into place then that’s a start. We’re talking about a process of 99,000 steps. And these are just two of them. 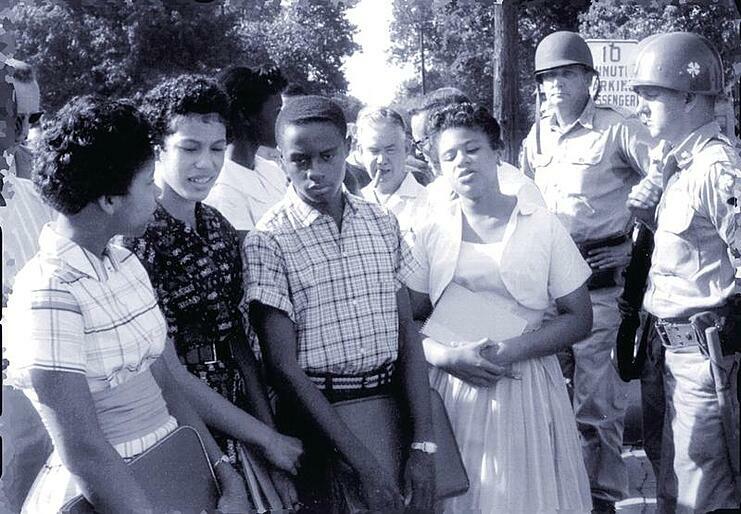 Want to teach your students more about the Little Rock Nine? Explore our resource, Choices in Little Rock. This unit explores civic choices—the decisions people make as citizens in a democracy—through the lens of this landmark event in the Civil Rights Movement.